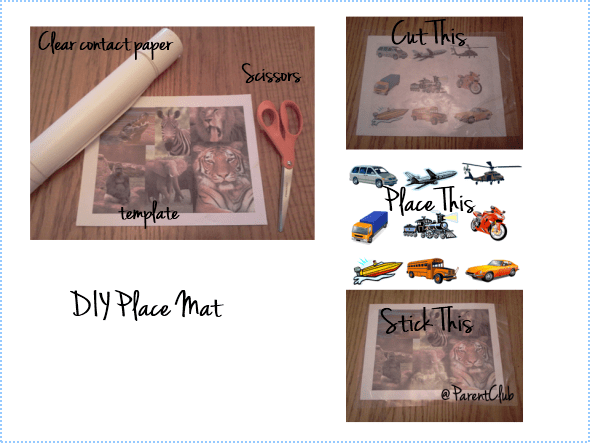 As easy as contact paper, scissors and clip art/photos…you can quickly (and super cost efficiently) Make Your Own Place Mat For Kids. I made this place mat in minutes (really). Switch up your place mats as your child grows into a new phase (my son is big into animals and vehicles right now so I made a two-sided place mat to occupy him during meals). Find images which fit with your theme. Think place mat themes like: favourite characters (cartoons, Disney, Pixar), animals (wild animals, pets, dinosaurs), places (Disney castles, stores your family visits, wonders of the world, maps), family photos, seasonal things (Halloween, Christmas, New Year’s, Valentine’s Day, St. Patrick’s Day, school break, Mother’s Day, Father’s Day). Copy and paste these images individually into a document (you can use Word, PowerPoint, Google Docs or Google Sheets). Save your Make Your Own Place Mat document. I chose to do enough images to fill up two pages so that I could have a double sided place mat. Print your documents (double sided if you have 2 pages). Cut the contact paper to size of image (I used an 8.5 x 11 for this place mat). Peal the paper off of contact paper and stick it to one side of your image. Flip image over and stick 2nd piece of contact paper onto back. These Make Your Own Place Mats are portable too (so you can take them to Grandma’s or a restaurant should you need portable boredom busters. You can also clean the place mats by giving them a gentle wipe with a damp cloth. psst…lots of other great kids’ activity ideas in my book Boredom Busters and More Boredom Busters…look for them in school libraries, public libraries, and bookstores. This is fun activity, extra mat will be always useful as kids lose them all the time somewhere at home! I can just see a little boy being totally engrossed in this fun placemat! All the things most little boys enjoy! I need to have little kids again! or just make those and see how the male adults handle it at my next dinner party. That’d be fun! Thanks so much for sharing this at the Dishing It & Digging It Link Party. Hope you found some great new friends and had fun. I remember buying so many place mats for the kids ad they would have loved to make their own. Thanks for sharing this on Merry Monday. These are very cute, and a great idea! Thanks for sharing at Celebrate It! This is such a fun and cute idea, a great way to make their favourite character placemat!! I wish I was more crafty but nothing ever looks like its supposed to!! This would be a great craft for kids to do every year as their interests change. When my kids made their own lunch matts they loved them. What a clever idea, I would make one with leopards and cheetahs for my son! I really like this DIY as it is fun and easy to do and we always need placemats. This is such a great idea, they can help you make it! Lots of fun!